One that makes a group look nice when embedded on a dark page would be useful. Exactly, themes like the kind Google Sites provides so I could match a Group "template" with the one I use with Google Sites. I mean it's so obvious this has to be implemented FCOL (For Crying Out Loud). Seriously? White and grey? It's been almost a year. Where are the others? 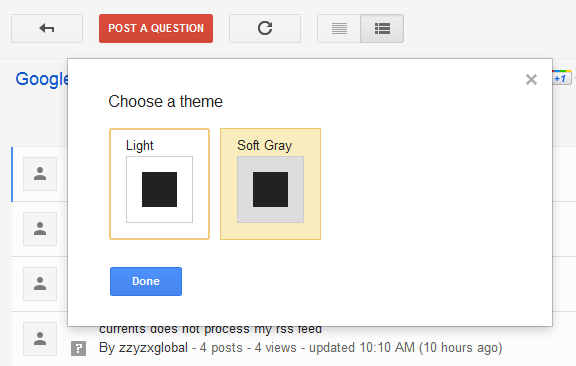 Cannot believe there still are only two color themes :( Please get this fixed Google! Just a little bit lite for Google company. Microsoft is doing better for their collaborative platform.